Gentle spring/summer thermal flat water cruising! Frontal storms and coast-like waves! There are four parking options. This place provides gentle spring/summer (Feb-July) light afternoon thermals on sunny days. 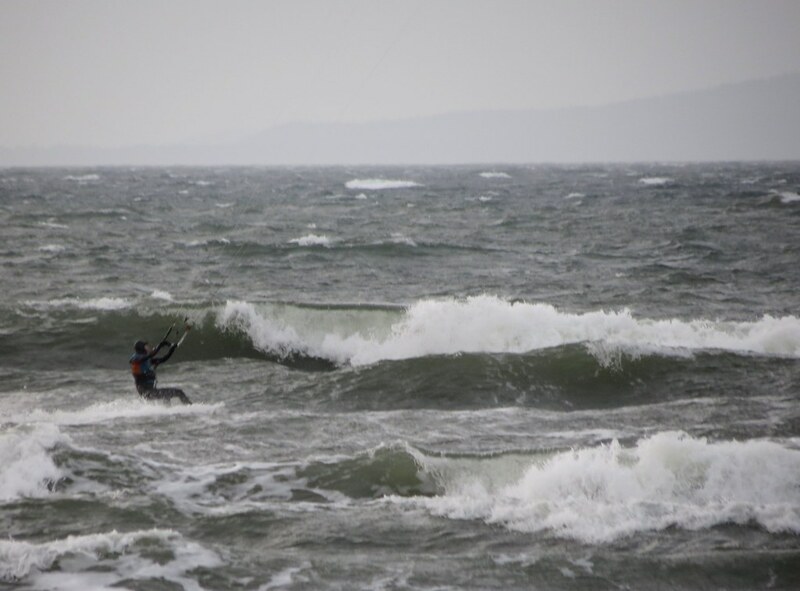 Great conditions for big kites, big boards, no wetsuit (in summer)! Southeast can be gusty, but the southwest through northwest bring the waves (and steadier wind). 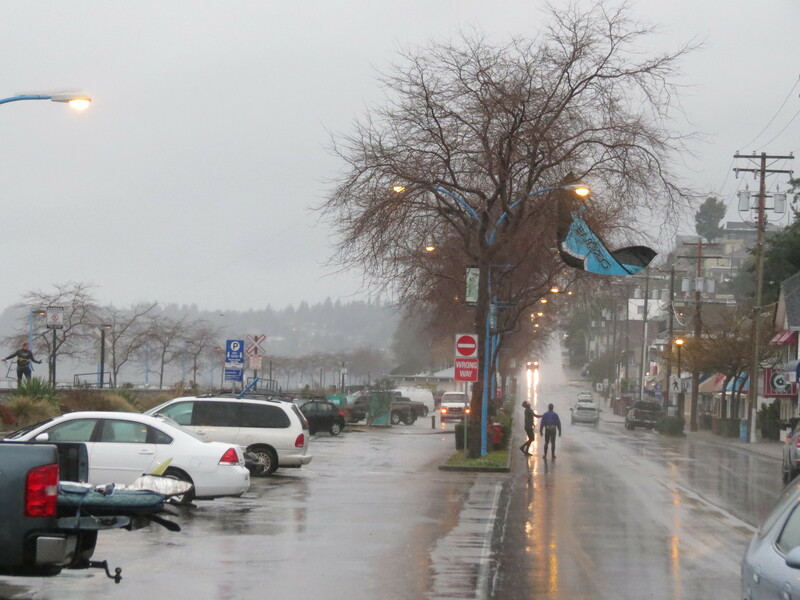 NW winds can loose some power coming into White Rock. For full NW wind exposure look at Acadia/Spanish Banks or Garry Point Park. Often there can be wild swings in direction and strength that can leave sailors yelling out loud in frustration at times and in bliss at other times. In general, southeast wind is the puffiest and the more it rotates to the west and northwest the steadier the wind can get (especially once it is clear of the point on southwest). 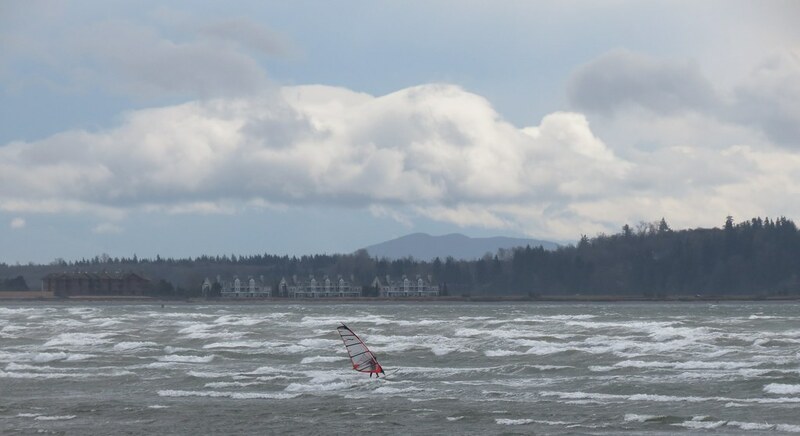 White Rock East Beach can stay fairly flat in gentler wind, but when the wind picks up it is the closest thing to a coastal wave here in the Lower Mainland (shape, speed and behaviour). On winder days the waves are generated by the rolling swell from the deep water breaking over the shallow flat bench of sand. Mid-tide (mid-two’s to mid-three’s) seems to encourage the waves the most. When the bank is exposed (less than 1.5 M) you don't get waves, you just get rolling swell out in the deep water off the bank. 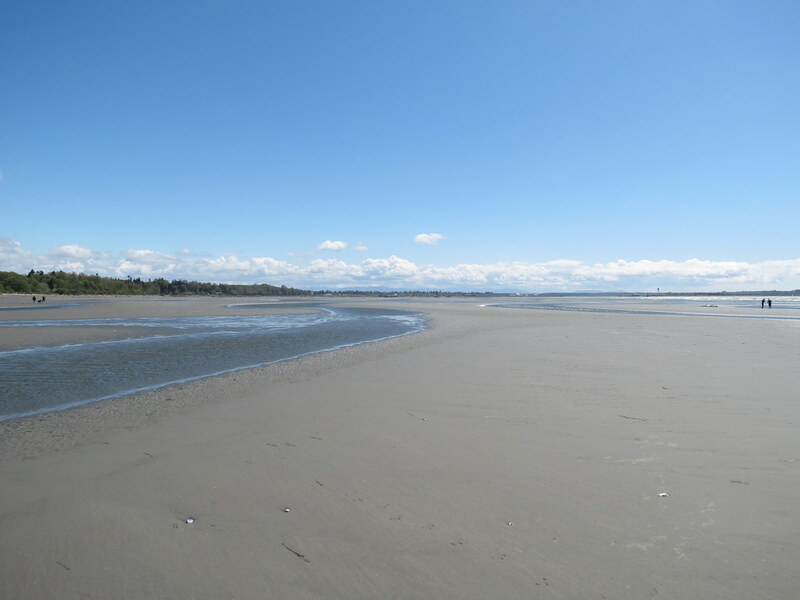 Huge expanse of water running 4 km from the pier to the south edge of Semiahmoo Bay or almost 9 km from the Point to the southern edge of the bay. 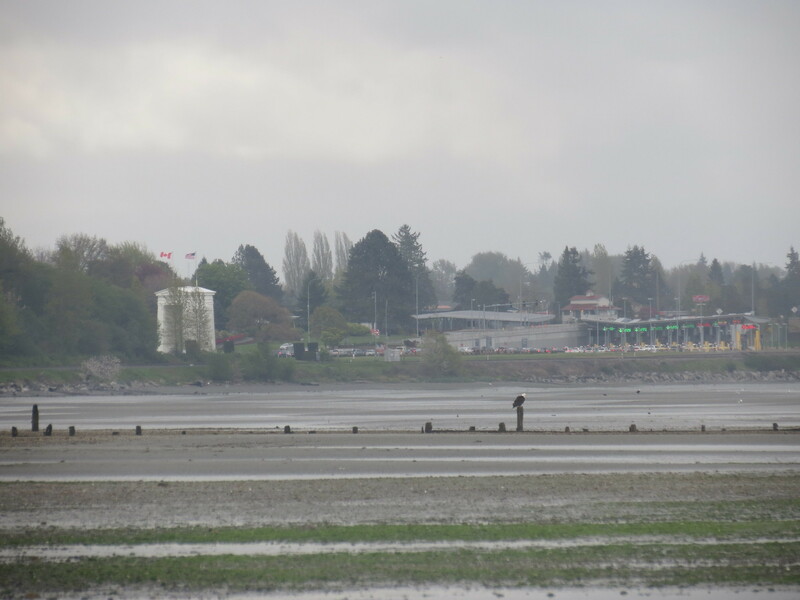 It is possible to sail at White Rock East Beach on any tide height and even low tides don’t pull the water that far away. On higher tides the shallow water running along the beach deepens the further you go out. On lower tides the bench exposes to reveal large expanses of sand. On south-southeast through north-northwest you will be safely blown back into shore if you have a problem. From Marine Drive, cross the railway tracks to reach the grass lawn, take a few steps down to reach the beach (or water on a high tide). There can be some Eel Grass (weeds) at the tide line which can make launching a kite harder. There are usually enough people around to launch if it's windy at any tide just lots of seaweed in your lines if you self land in the water at higher or really low tides. Below 3.5 m tide solo launching/landing is easy as this is when the sand start to show. At about 3.5 m most of the sand may still be covered by water, but you can put your kite at the water and walkout . 4 m tide and above is hard/sketchy depending on wind direction and quantity/quality of help. Southwest wind can be straight onshore making launching particularly difficult. When this happens its worth walking kites out into the water, with help, for a safer launch. At high tide the weeds in the water can make it hard to launch even with one other person helping. 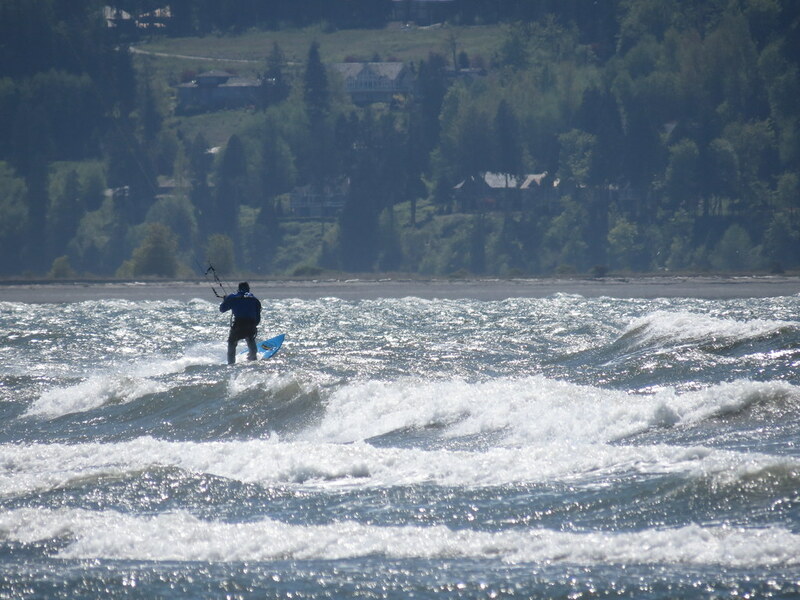 Although the west (grass) launch is more popular the east launch, as described here, is a good option on high-tide - shallower water, smaller waves, less people and less wind shadow. Railway tracks - always look both ways! US border - do you have out-of-province health care coverage? 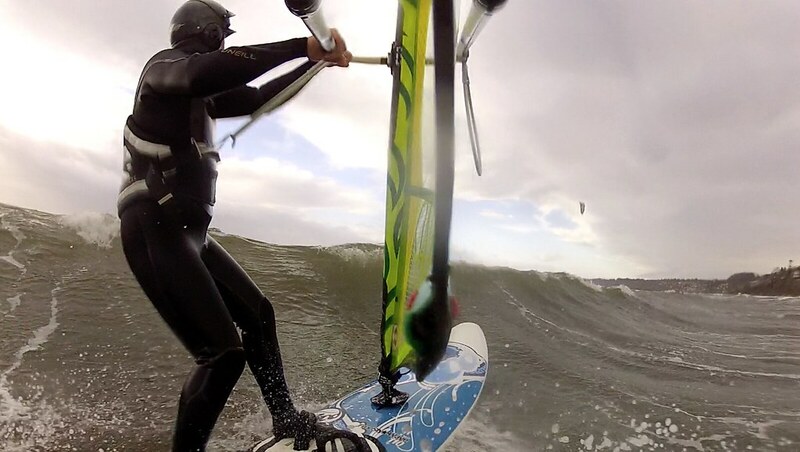 BradR encouraged the windsurfing community to try this spot a few years back and we are thankful to him for doing so. He knows this spot really well and has graciously shared his knowledge with us. Tweegser for the addition of the spring-summer thermals and tide info. Patrick for 3.5 m tide kite launching info. \edit (2015 Feb 23): GoPro shot and photo credit added to "Water", "Conditions" section. 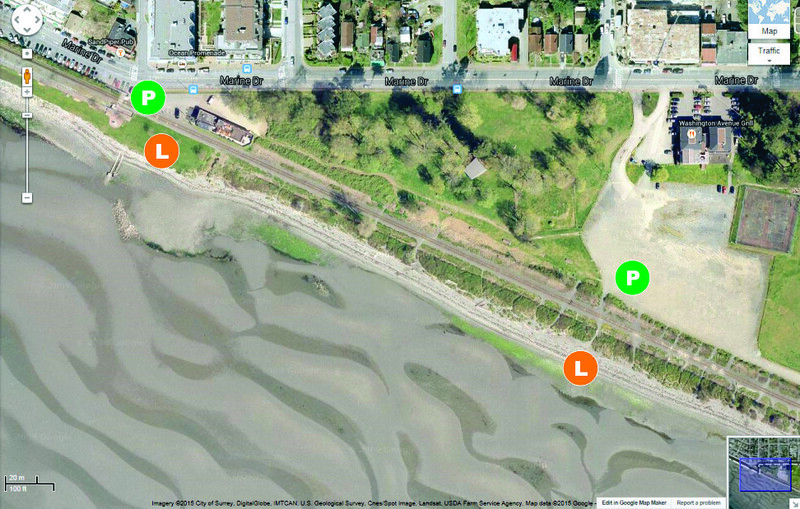 \edit (2015 Sep 4): More detail added to "Launching" section for kites at 3.5 m and 4+ m tides. Last edited by C36 on Wed Oct 05, 2016 2:01 pm, edited 26 times in total. Excellent write up. The only thing I would add is that spring (Sunday, Feb 15) through July it does get a light afternoon thermal on sunny days. 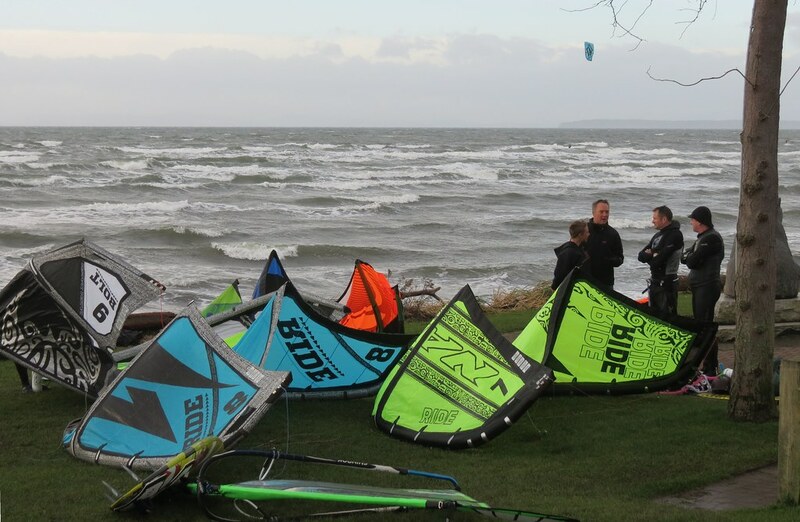 Big kites, Big boards, no wetsuit! tweegster wrote: Excellent write up. The only thing I would add is that spring (Sunday, Feb 15) through July it does get a light afternoon thermal on sunny days. 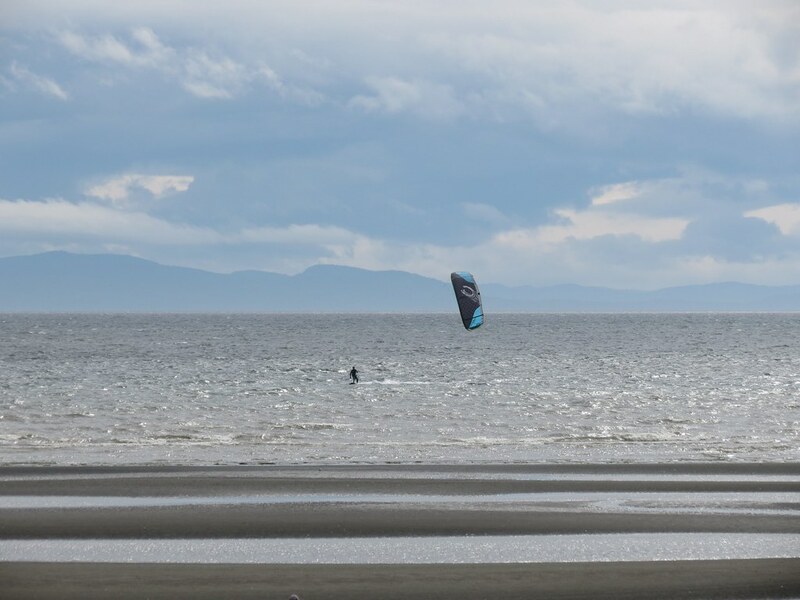 Big kites, Big boards, no wetsuit! Actually we windsurfers would consider that getting skunked. So probably not even on Dave's radar. Thanks again Dave awesome stuff. Thanks for the thorough write up Dave! One more sweet spot To add would be the windward nw side of the pier and it's smaller sandbar waves close in on WSW to nw. Very worth sailing around the breakwater to check out that shorter side of the bay. If you get enticed by the waves just off the bluff though don't get caught in the back Eddie of wind and get slammed into the tall railway ballast boulders like Gary and I did! From the entrance of the Mariana to mid way down the pier of fun short shelf though. I have also noticed the thermal effect increasing over the year as the valley gets more development... More black top please! Wal-Mart supercentre adds an extra 2 knots!! I hear you tweegster. That is the challenge with writting up a spot like this, characteristics are very different give time of year and wind speed. 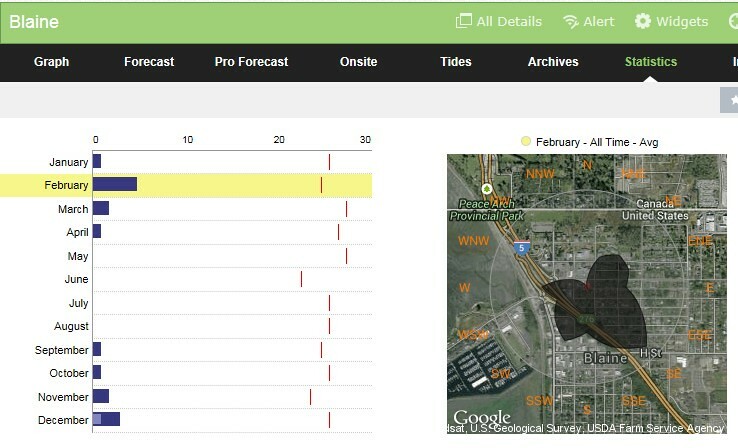 I have since added a new intro pictures; the South 15 mph on a low-2 m tide (2013 Apr 27) example to show it's not 'crazy' wavy all the time; and pick-up your comments in the "Wind" > "Seasons" section. Let me know what you think. I'm also more than happy to add pictures provided by others, but I would want to make sure that they are pictures you have the rights to and I would need a link to hosted file (I can't seem to source to the location 'attached' files. Most of the files I have been using are 1024 x 768. Michael wrote: Actually we windsurfers would consider that getting skunked. So probably not even on Dave's radar. Thanks again Dave awesome stuff. Oh I've seen the 'lighter' thermal set-up a few times (painful tease that it is) - one time DB and I wallowed around for an afternoon hoping for just a little bit more. Still fun to get out on a pleasant afternoon. Brad R wrote: Thanks for the thorough write up Dave! One more sweet spot To add would be the windward nw side of the pier and it's smaller sandbar waves close in on WSW to nw. Very worth sailing around the breakwater to check out that shorter side of the bay. If you get enticed by the waves just off the bluff though don't get caught in the back Eddie of wind and get slammed into the tall railway ballast boulders like Gary and I did! Thanks for the comments. This makes is sound like "West Beach" starts at the boat ramp and runs past and includes the pier. I was orginally thinking of a seperate one on "West Beach" to cover the other stuff you had previously posted below. I don't know too many people, other than yourself, that would dive into that bay from around the pier and hope to be able to work themselves out of there in the lifting, shifty wind. I guess the question is can you launch from West Beach and make it out to the pier or is the only approach from dropping in from the East Beach side? Let me know what you think. 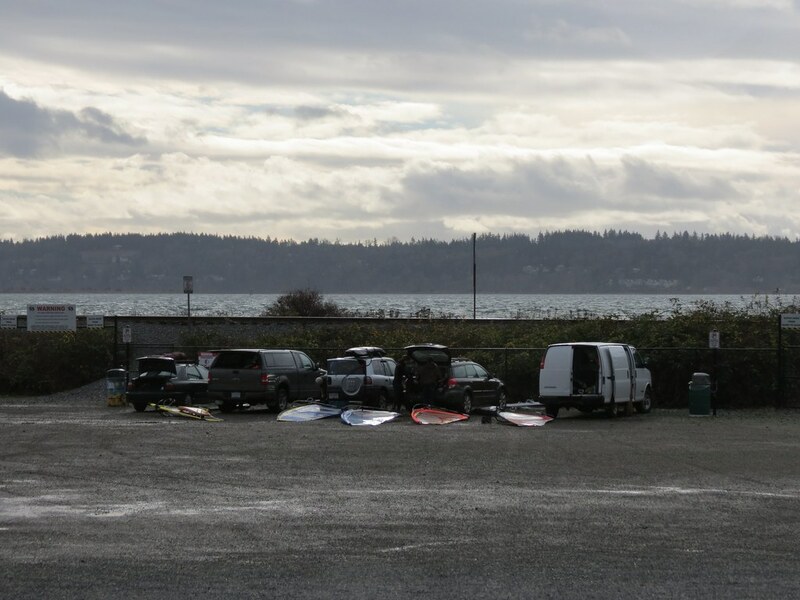 Brad R wrote: - White rock west beach at the foor of the bluff - SKETCHY SPOT but amazing rampy waves. the trick is if you get too close to the bluff the wind back eddies and dies out while big waves deposit you onto moving boulders with no beach. Gary and I almost git seriously hurt here while we were seduced by the sweet waves there and have not been back since. Wrecked some gear too! If you keep your distance from the bluff and watch the wind line it is fantastic - SW to WNW. It's a little tricky to get out at west beach. I have had days when it is nuking and can barely get off the beach. However some days have worked out well and it is certainly less work than working upwind from east beach. If the aim of the day is to sail only there then launching there is easiest. Lately I have adopted an "ala carte" approach to the area. If you are having success pointing upwind, then just nip over there. On occasions that I go to that side I usually let someone know so that no-one gets concerned when I disappear for a while behind the pier. I have had some great days exploring the pier then trickling downwind to the river. Lots of terrain for sure! Under "Sweet Spot(s)," I suggest putting AYCE fish & chips on the list. Just a short walk across the road. 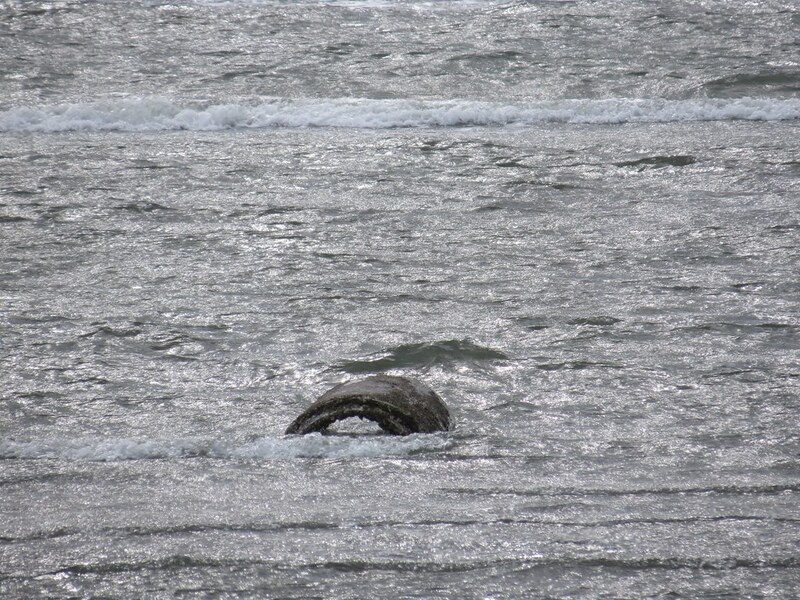 Brad R wrote: It's a little tricky to get out at west beach. I have had days when it is nuking and can barely get off the beach. However some days have worked out well and it is certainly less work than working upwind from east beach. If the aim of the day is to sail only there then launching there is easiest. Thanks Brad. Where do you launch from at West Beach? Really great write up Dave. Nothing really that i would add other than the comments that Brad made. Still my favorite spot to sail when the stars are aligned and the conditions are perfect. I remember days of 7 foot waves out near the pier. Dave, I park right at the far west end and walk in at the boat launch.